Classic, statement engagement rings, featuring custom-cut center stones, are at the heart of new Jeffrey Bilgore jewelry designs. Lotus Ring by Jeffrey Bilgore. 6.25 ct. oval padparadscha, with 53 round diamonds, set in platinum. It is time to return to our instincts and the feeling that only colored gemstones can evoke in each of us. Show that this is a world of color and love. For years, colorless diamonds have set the standard for bridal. Set in platinum or 18K yellow gold, engagement rings with timeless settings have a distinguishing look. Today’s bride-to-be wants to embrace tradition, yet add her own signature style. Couples are coming together to create rings with meaning, and are embracing colored gemstones for added significance and artistry. Jeffrey Bilgore, jewelry designer and international gemstone merchant, specializes in creating one-of-a-kind pieces for memorable moments. “Every couple’s love is unique, individual, and beautiful. The jewelry that is part of this is more than symbolic, it should reflect on these three qualities. Each gemstone, every ring design is a part of the couple, on their wedding day and every day beyond,” says Jeffrey Bilgore. Ethically sourcing the world’s finest gems, Bilgore travels internationally to select high quality sapphire, padparadscha, ruby, spinel, and more. His statement rings and earrings feature colorful center stones, with designs drawing inspiration from the gem itself. For his rutilated quartz ring, Jeffrey Bilgore emphasizes the beauty of golden rutile with a simple, study, classic 18K yellow gold and diamond setting. The focus is on the golden wisps, and the wearer can easily admire the grace of the smooth sugarloaf cut, which acts as a looking glass into the stone. Upon seeing the stunning cut, color, and size of a rare padparadscha, the designer envisioned the gem sitting within a lotus. A flower with many meanings, it symbolizes both fortune and purification; in addition, a fully blossoming lotus represents enlightenment, and therefore self-awareness for the wearer. Figurative and literal rebirth is also associated. 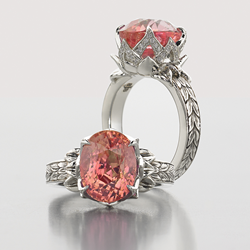 For bridal, the blessings of new beginnings are elegantly and symbolically represented within the lotus ring. Jeffrey Bilgore offers an array of stunning loose gemstones as well, available as a canvas to create new bespoke creations. 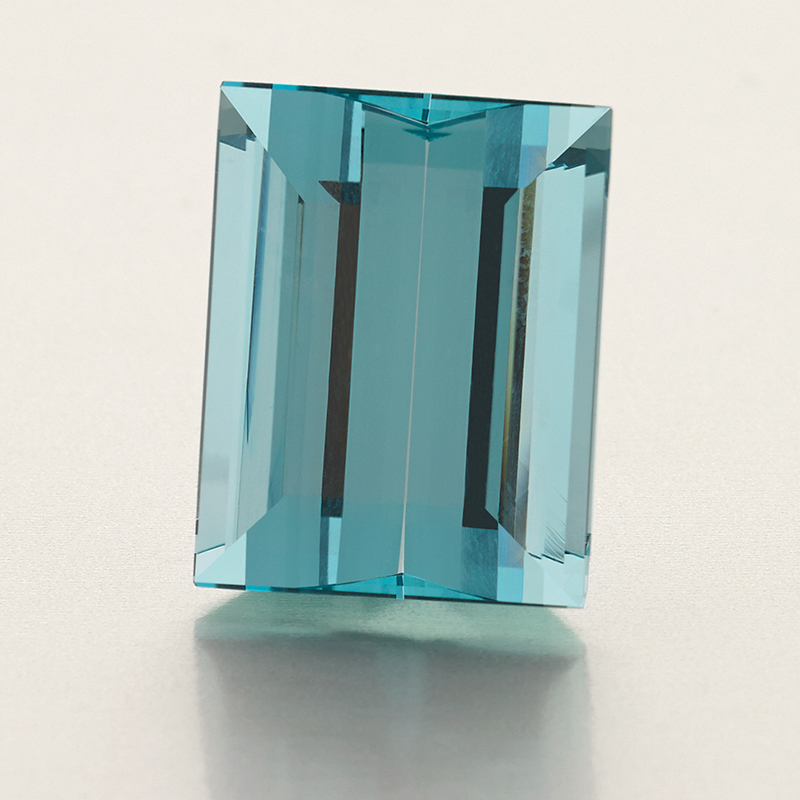 For brides looking for “something blue,” an aquamarine’s ocean of serenity is a popular choice. 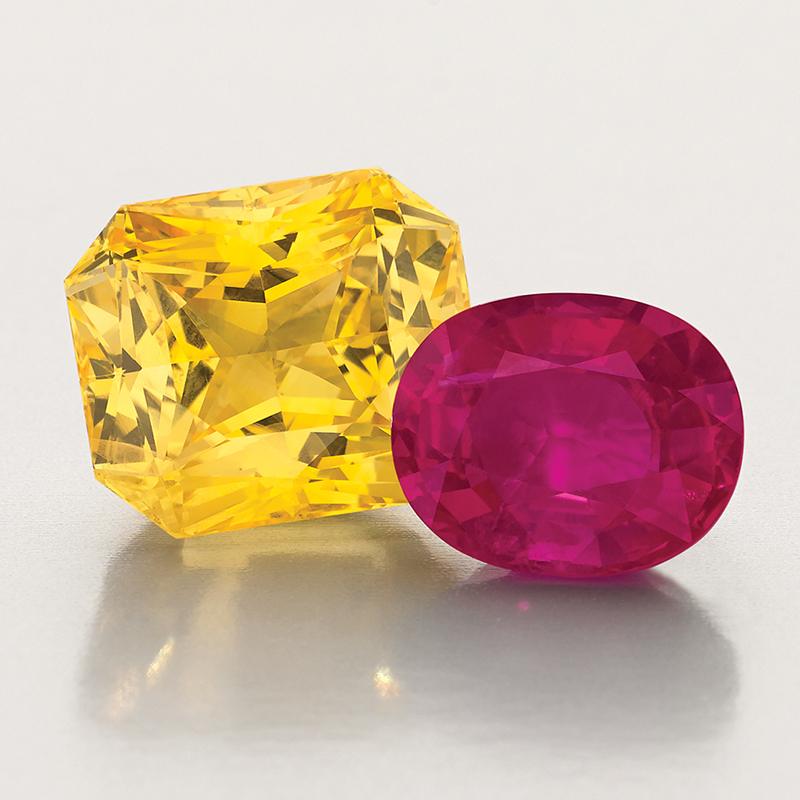 A radiant yellow sapphire or a Mozambique ruby also offer exceptional color and cut, with the exhilarating added excitement of personalizing the jewelry. 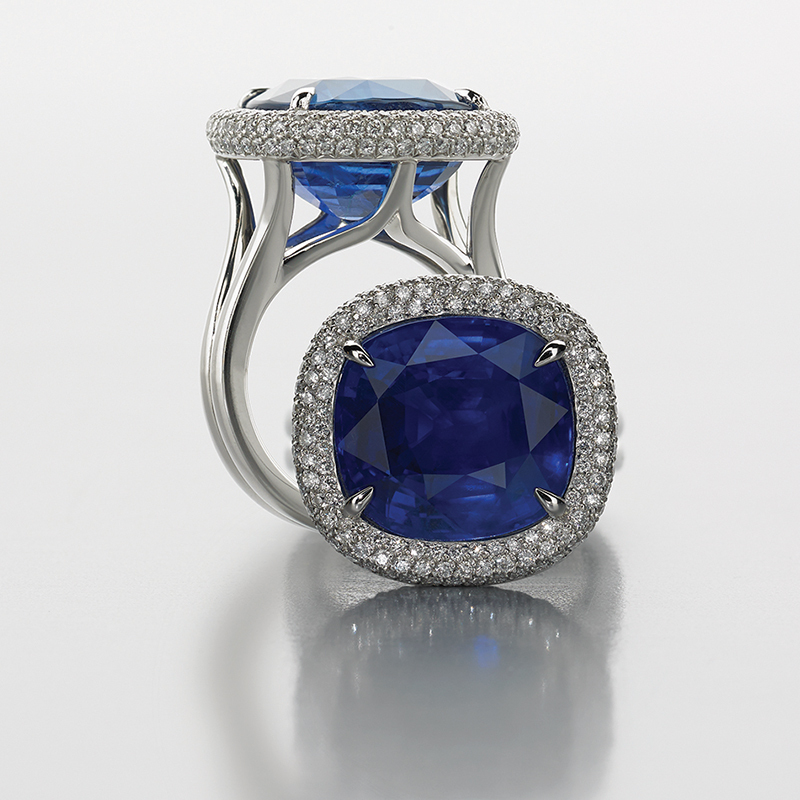 Made for a glamorous entrance, Bilgore’s signature sapphire rings, as well as his Mahenge Tanzanian spinel set, draw attention. Eye-catching vibrancy for the design-driven, a fiancée in a Bilgore signature perfectly balances elegance and glamour. To learn more about Jeffrey Bilgore, and request pricing, visit http://www.jeffreybilgore.com, or inquire with the designer directly through his contact page. For inquiries regarding this release, contact Olga Gonzalez at info(at)pietrapr(dot)com or call 212-913-9761. Jeffrey Bilgore is an acclaimed gemologist, professional gem buyer, gemstone cutter and jewelry designer. He has spent over twenty years buying for the world’s leading gem houses and retailers, specializing in procurement of the rare and exotic. His jewelry and cut stones have won or placed Honorable Mentions in 7 Spectrum Awards and 11 Cutting Edge Awards, considered amongst the most prestigious accolades in the industry. Burmese Sapphire Ring by Jeffrey Bilgore. Unheated, 16 ct. cushion-cut Burmese sapphire ring, with diamonds, set in platinum. Pink Sapphire Earrings by Jeffrey Bilgore. 2 oval pink sapphires (8.42 tcw. ), 2 pear-shaped pink sapphires (13.91tcw. ), and 2 asscher cut diamonds (1.54 tcw. ), with 153 round diamonds,set in platinum 30ct. Radiant Yellow Sapphire and 13 ct. Mozambique Ruby by Jeffrey Bilgore. Rutilated Quartz Ring by Jeffrey Bilgore. 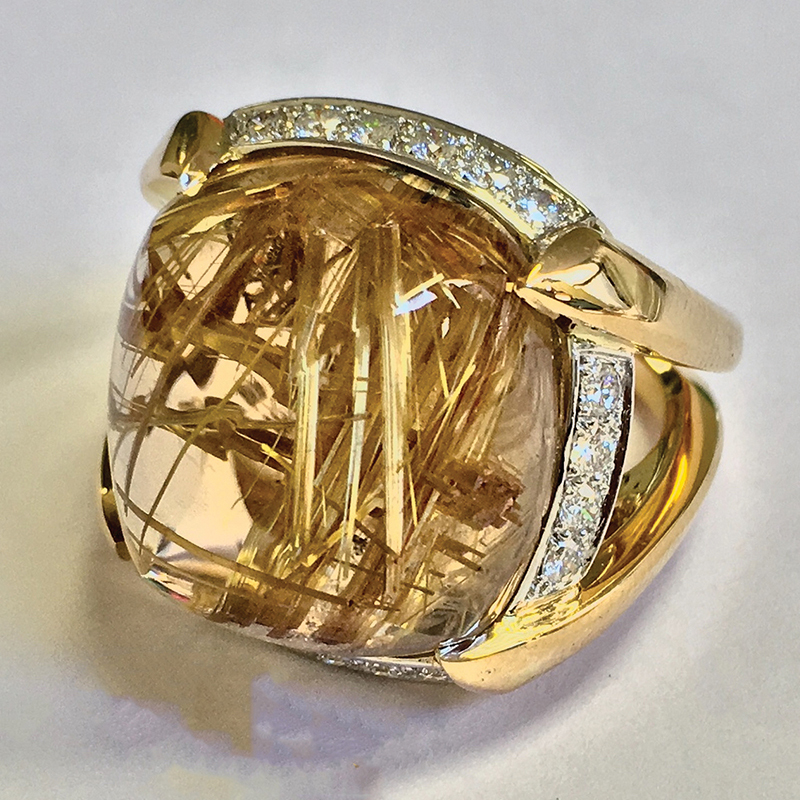 24.65ct sugarloaf rutilated quartz, 20 round diamonds, 18 yellow gold, and platinum. Platinum Mahenge Tanzanian Spinel Set by Jeffrey Bilgore. 7.92 ct Octagon Cut Unheated red spinel ring, with diamonds, set in platinum 3.11 tcw. oval red spinel earrings, with diamonds,set in platinum 30 ct. Baguette Aquamarine by Jeffrey Bilgore.